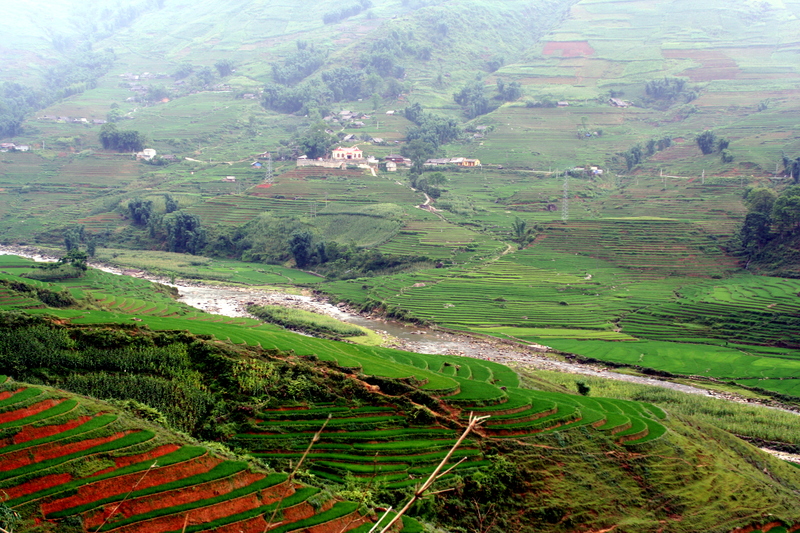 Sapa, with its verdant green rice paddy terraces. A world so different from my flat Minnesota and Danish homes. My eyes could not soak in enough of its exotic beauty. I was so excited to share the wonder of the place that I uploaded a few photos to Facebook early in this trip, before I had figured out the logistics of working on my blog from the road. Now comes the full report. 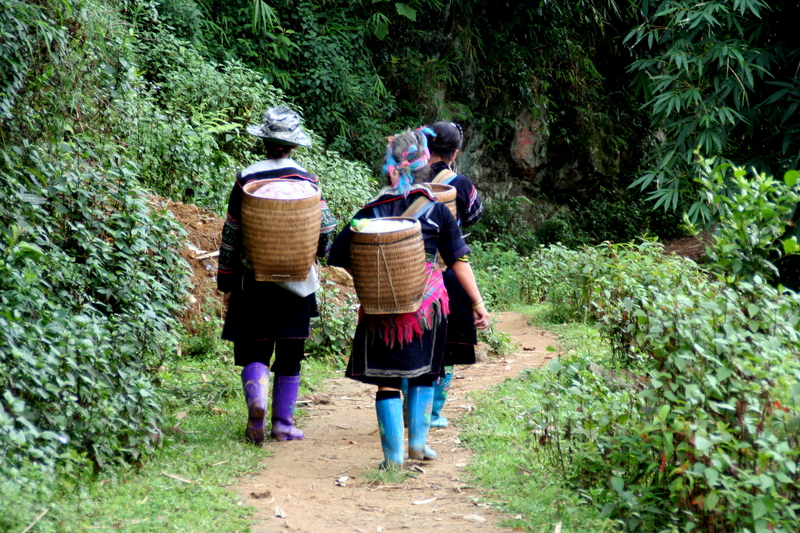 A visit to Sapa is mandatory for anyone visiting Hanoi and northern Vietnam. 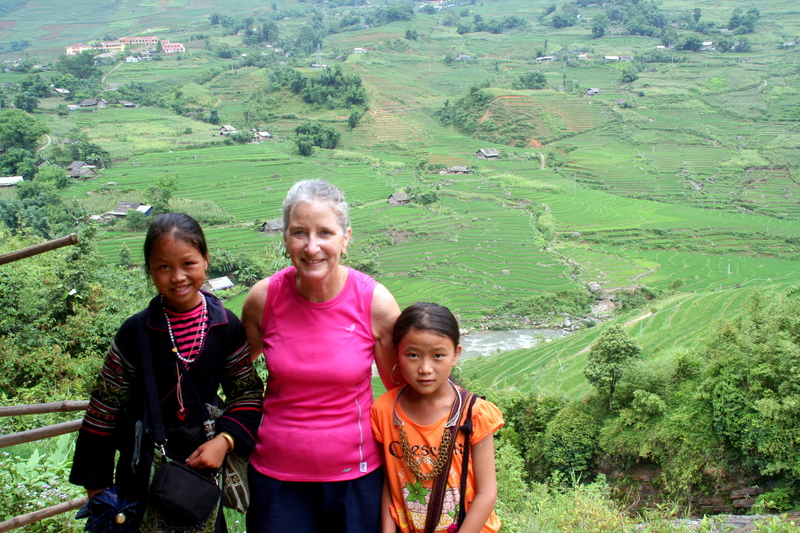 Bryn and I opted for a 4 night, 3 day trekking excursion, including a village home stay. Our excursion had us leaving on a 10 pm night train to Lao Cai. We were picked up at our hotel and taken with several other travelers to the train station. The station was crowded and I was grateful there was a travel agency representative there with us to make sure we got on the right train. Our tickets placed us in a four-person sleeper cabin with a young German couple. 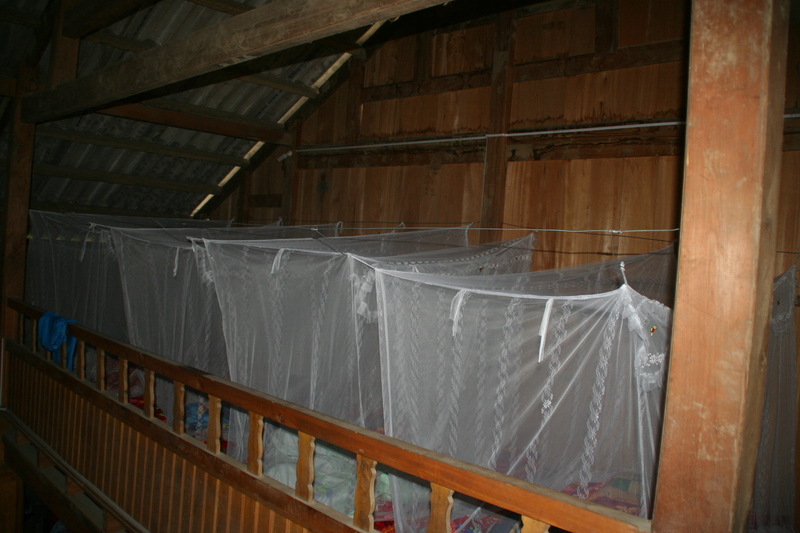 We all settled in quickly, stowing our large bacpacks under the bottom bunks and arranging our essentials in our respective beds. Earplugs and eye mask came in handy, but our six am arrival came before I was really ready for it. 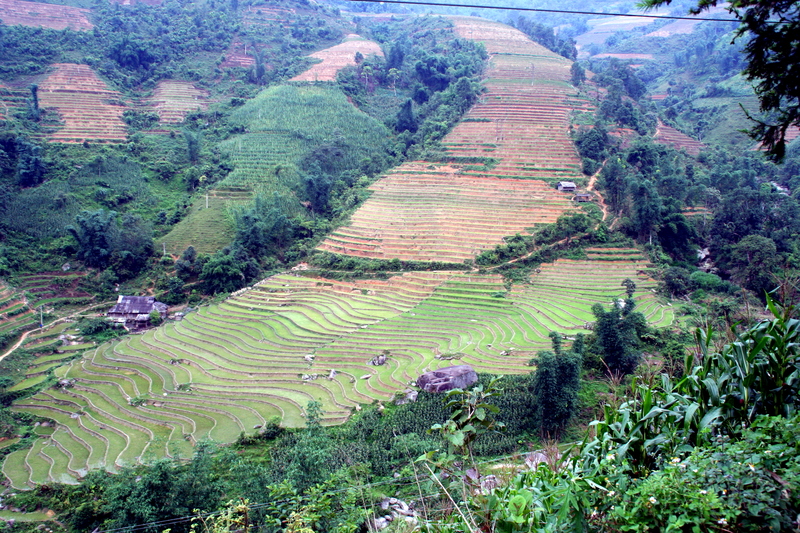 Then it was off the train and into a minivan for the 1-1/2 hour drive to Sapa. The road was mountainous and curvey, and our driver took my breath away several times as he passed vehicles without being able to see if there was any oncoming traffic. We arrived safely in Sapa, however, and were dropped at a hotel where we had the opportunity to shower and have breakfast before heading out for a day of trekking. Kuong was our guide, cook and companion for the following three days. A native of the area, this charming, gentle man, had a sly sense of humor and a deep knowledge of the local flora, fauna, geography and culture. The trails he took us on were challenging and the scenery was spectacular. 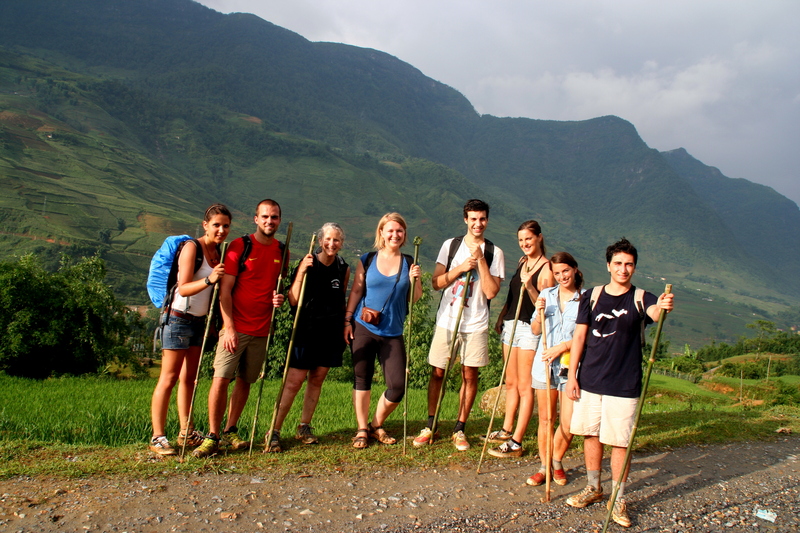 Our trekking group included the Germans we had slept with on the train and four young French people from Singapore. 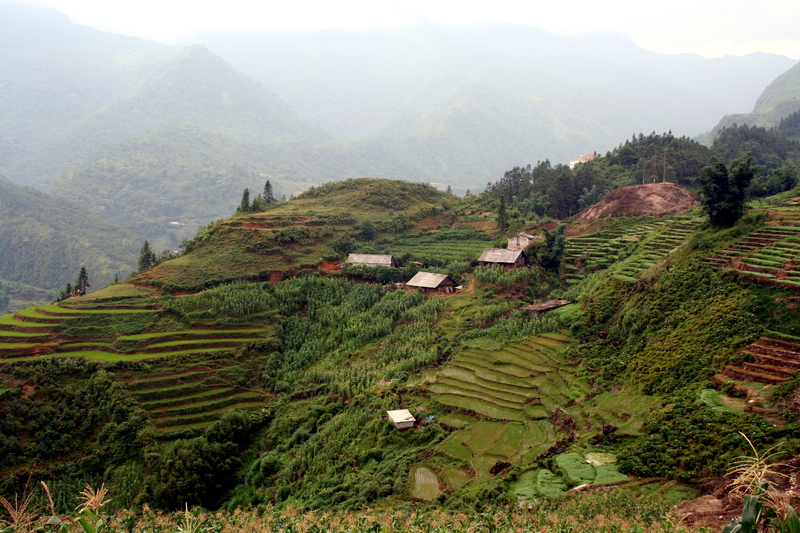 Our visit to Sapa was in the rainy season. I think the trails would be tough regardless, but when they were wet and slippery, they were particularly rough. Local minority (Hmomg) village women latch on to the various groups of trekkers and offer a hand. Initially wary of what they would demand for compensation, I quickly gave in and accepted the assistance. Kuong said they would expect us to shop from them at the end of the day. You won’t see any photos here that showcase the challenging nature of the tails, however. During those portions of the trek, I was too busy holding my helper’s hand and concentrating on not falling to take pictures. Here, on a flat portion, you can get some kind of idea of the quality of the trail. You’ll have to use your imagination to envision it going straight up and straight down a hillside. 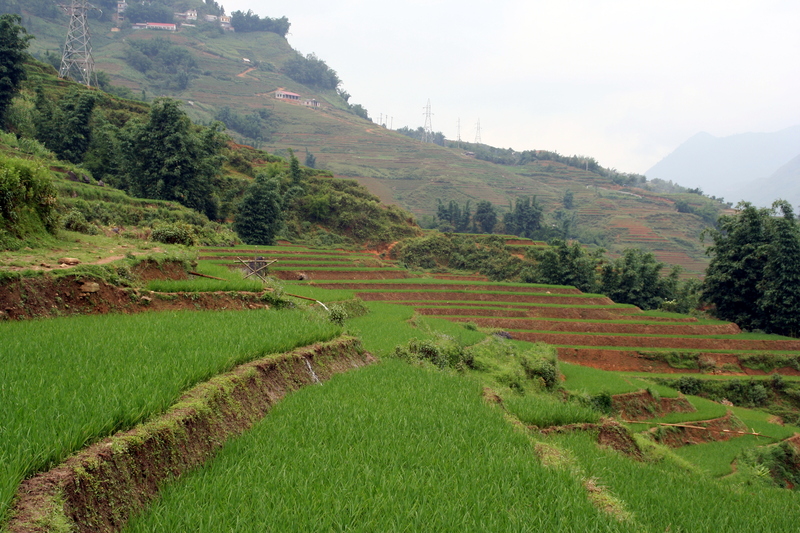 In case you are wondering, the terraced fields in the Sapa region are mostly planted with rice. 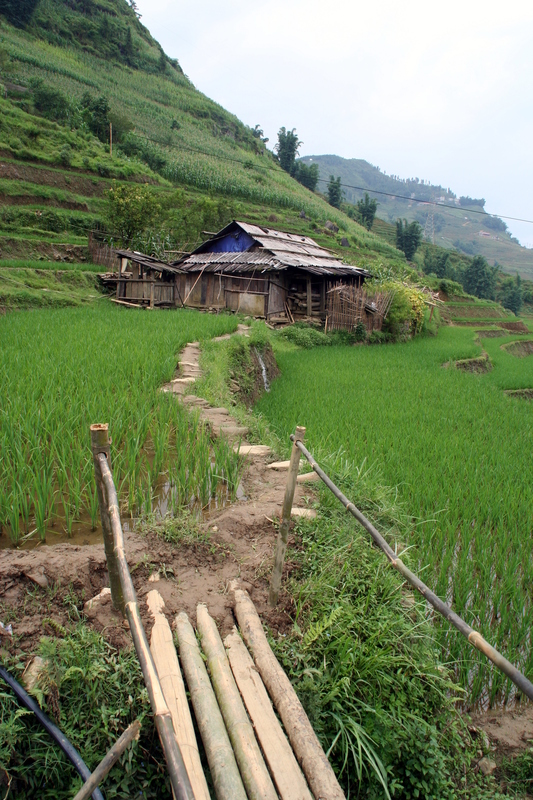 Vietnam is the world’s second biggest exporter of rice, following India and ahead of Thailand. 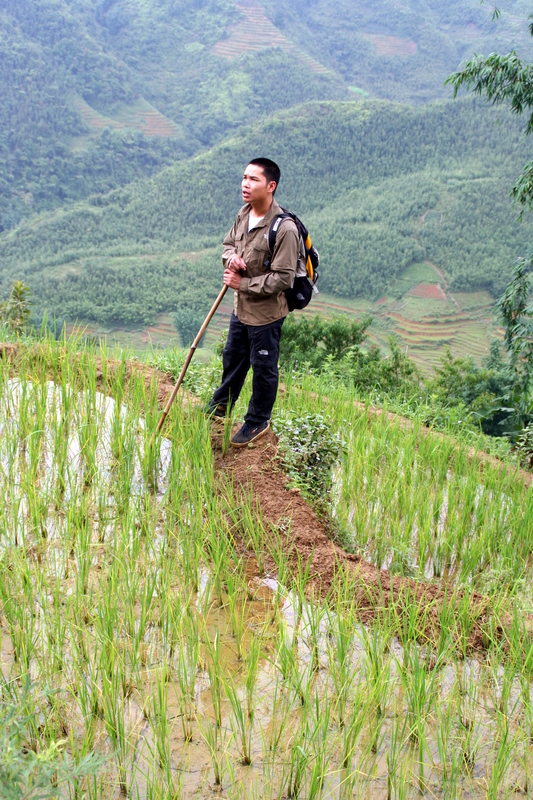 The Vietnamese consume the most rice per capita of anywhere and still are able to achieve this level of exports. 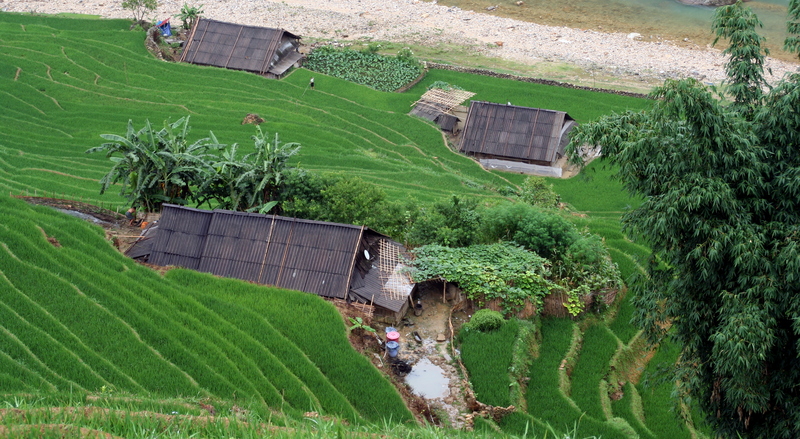 And rice production still largely occurs without machines, with the seedlings all transplanted by hand. 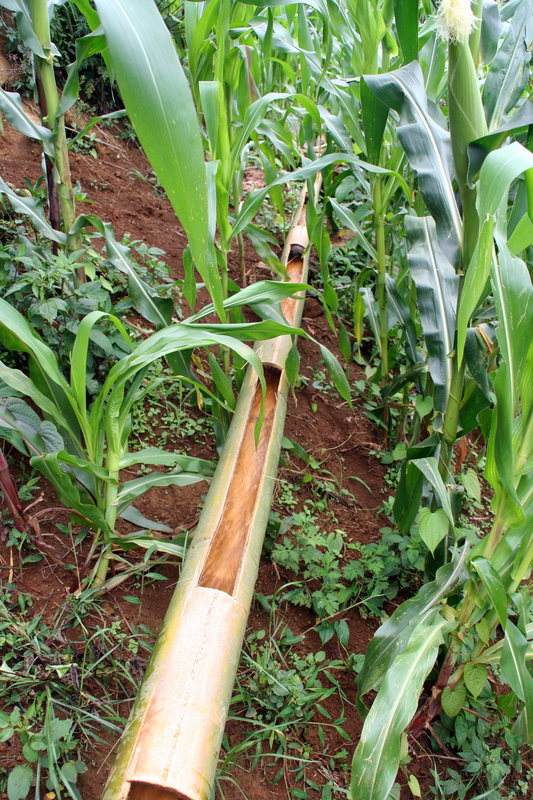 Irrigation of the fields is aided by gravity. 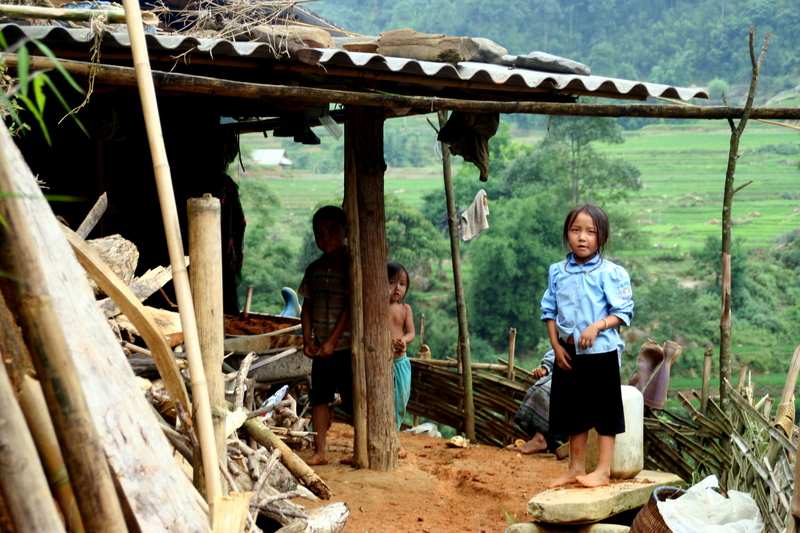 Vietnam’s population is currently 88 million and growing at about a million a year. The government has a two child population policy, but the minority populations ignore this and typically have ten or more children to help with the farm work. After a hard day of trekking, I rewarded my Hmomg helper by buying a belt, a headband and a water bottle carrier from her. I would have been happy to tip her for the help she gave me. As it was, I also came away with some beautiful handwork that will remind me of our day together. Our group was all happy to reach our home stay destination. We were ready to sit and relax for a bit. A few of us helped Kuong in the kitchen as he prepared our dinner, while others enjoyed a beer on the front patio. When Kuong brought out our dinner, our host brought out rice wine (it’s called wine even through it is strong like a schnapps and one drinks shots). We made a couple of toasts, drank our shots and got pretty merry. 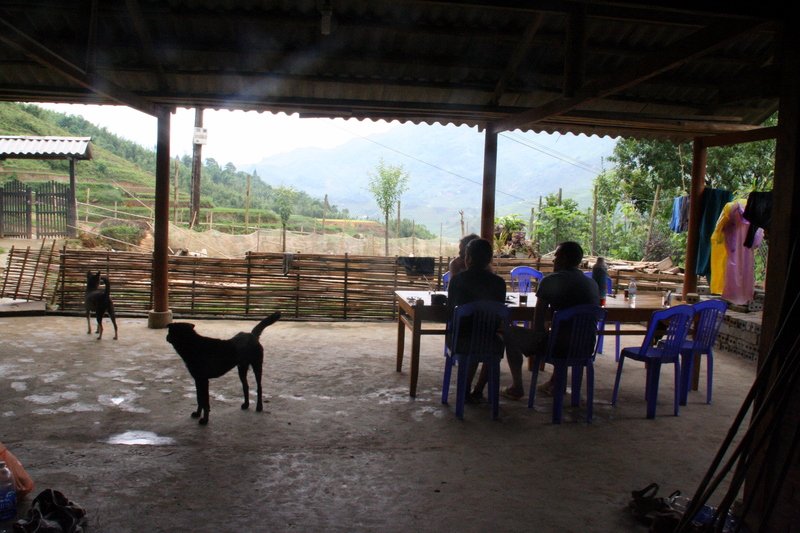 We guests ate (and drank) on the patio, while Kuong and our host ate in the kitchen. After a while our group drifted in pairs into the kitchen, where four or five village men had joined our host. Each local then drank a shot with each guest. Needless to say, much rice wine was consumed. I lasted through about five or six more shots, but then made my way upstairs to our sleeping quarters. A remarkable thing about rice wine, though, no hangover! Day two of trekking started out just as challenging as day one. More rain made the trails freshly slick. 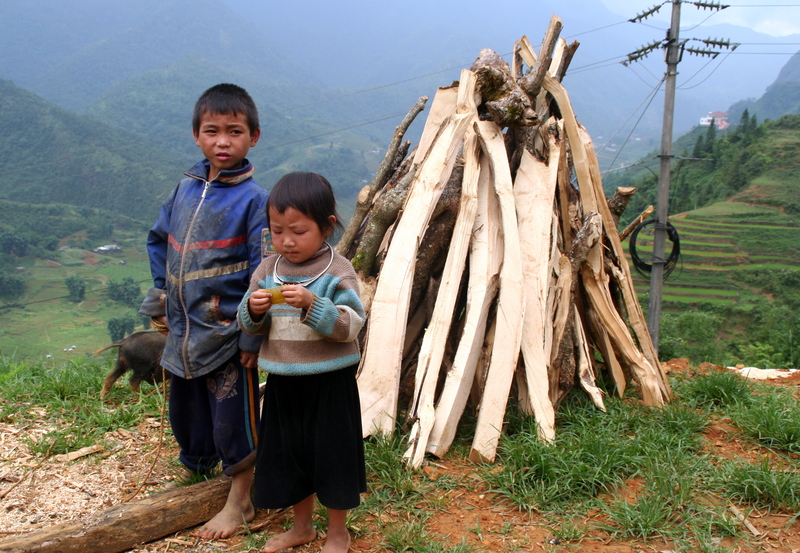 When two young Hmong girls offered me their assistance, I couldn’t resist. “You be careful, okay?” was their oft repeated admonition. After a particularly challenging section of trail, where everyone fell at one point or another (even me WITH two helpers), we had a group conference and Kuong modified the trek for us along easier trails. 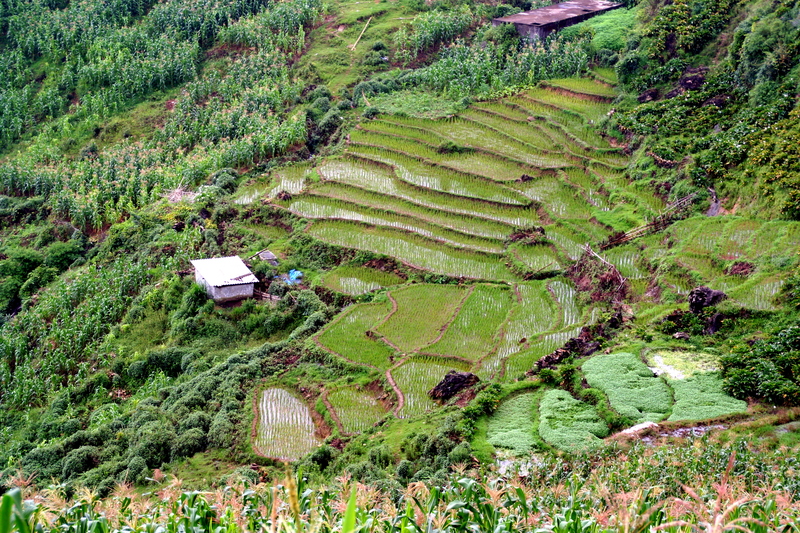 We visited a waterfall and a “Red Hmong” village before returning to Sapa via minivan. We walked past more fields. 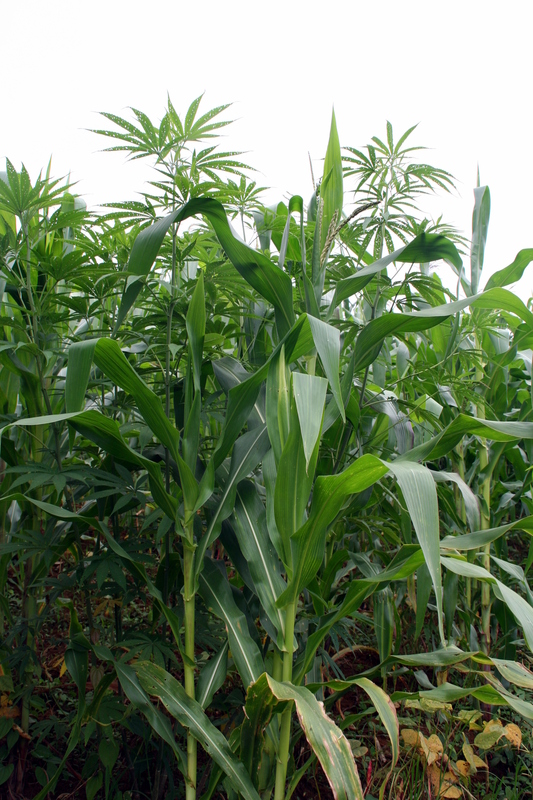 Here is one with hemp growing admidst the corn. The hemp is the non-mind-altering kind and is used to make cloth and rope. We passed by women working with the hemp to make thread, which we also saw them using to weave cloth. 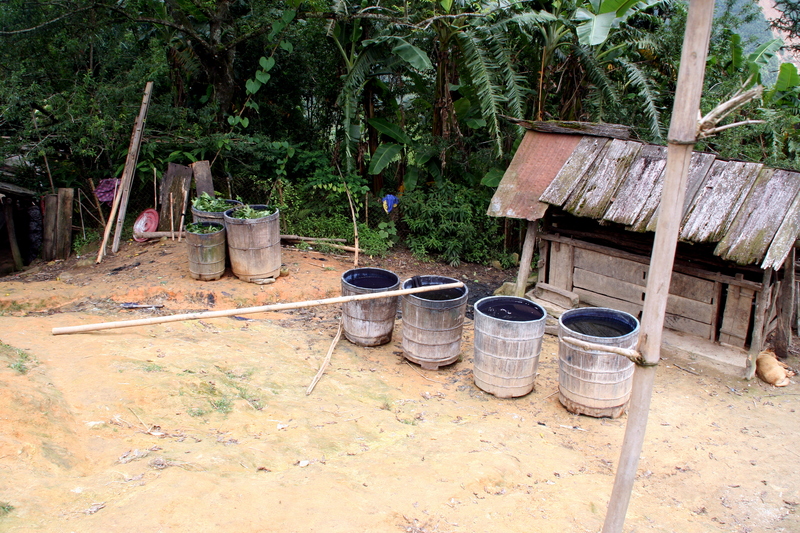 Below you can see some barrels full of indigo dye, made from native plants, which the Hmong use to color their fabric. 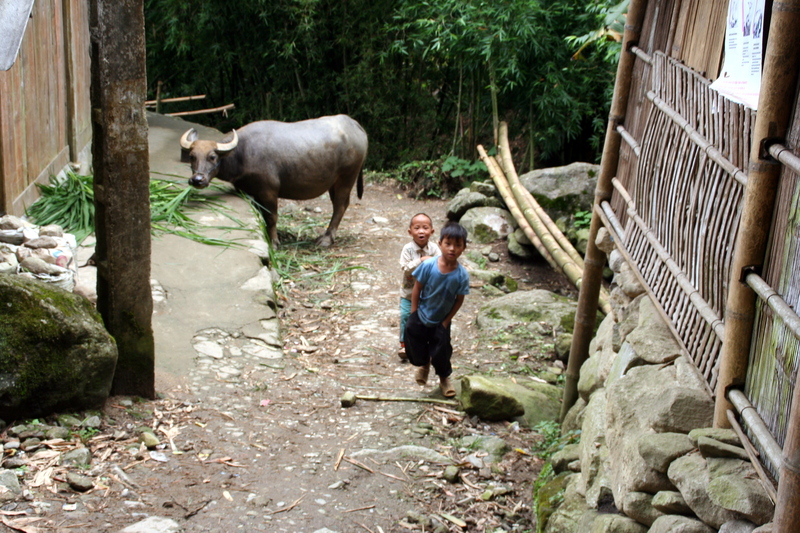 We also passed through villages and past curious water buffalo on our way. 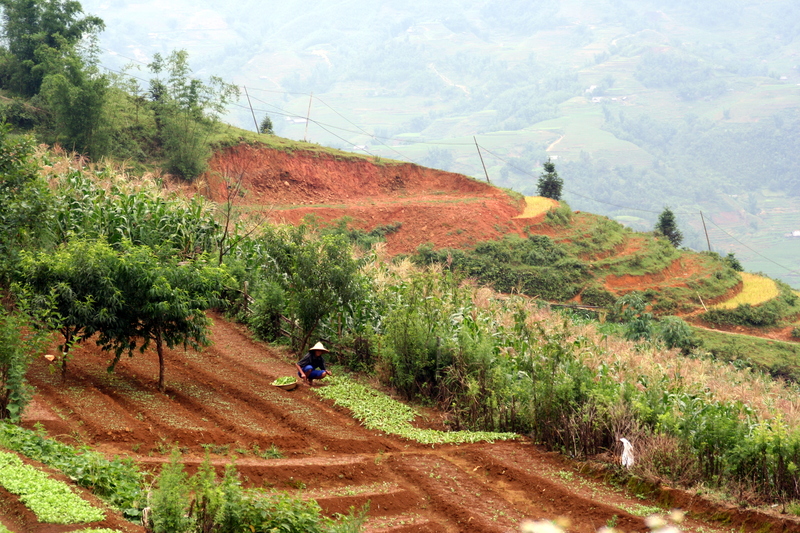 In retrospect, Sapa was my favorite place in Vietnam, due to its beauty and the quality of our guide. My next report will be about Ha Long Bay, also a spectacular natural area. 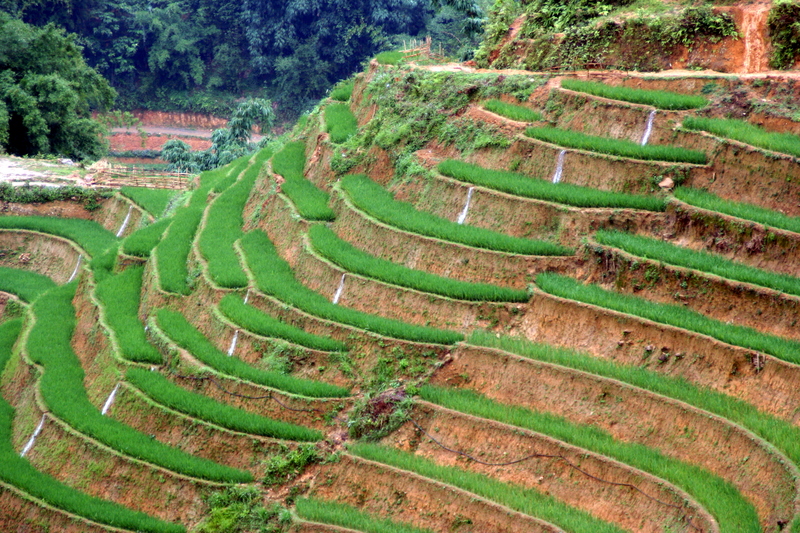 The terraced fields of rice in Sapa are extraordinary. Your telling of the need for hiking helpers underscores their magnificence. I took a few days to reread your entire blog and have truly found it to be a special treat for me to accompany you and Bryn on this magical journey together. Your photos and narrative are captivating and I find myself wanting to read on. Please do consider expanding your narrative into a book. You have established a captive audience. I am so happy for you that the present time continues to be your happiest time. Continue to be well and thank you for a lovely time. Those photos are so incrediable I can only imagine how breath taking it must be in real life. What an amazing adventure you are having. How different everything will seem through your new eyes when you come home. Thank you for sharing your stories with us.